Alpine is market leader in the field of hearing protection and otoplastics. Alpine has developed special otoplastics for motorcyclists, in other words; earplugs for motorcyclists. An otoplasty is a custom made hearing protector. A perfectly fitting earpiece is made of your ear impression in the Alpine laboratory. In it, special wind noise filters are installed, so that your engine and traffic remain audible. Your hearing is therefore not closed. Years of enjoyment of custom earplugs require good ear prints. Our vendors have obtained a special certificate from Alpine, so you can have ear prints made in our store. Making the prints takes an average of 15 minutes. We send the prints to the labratory, 2 weeks later you can pick up your custom made earplugs. Because we can choose from 5 different dB filters, we find the right hearing protector for every motorcyclist. Alpine has also developed a 'universal' otoplasty that fits most ear forms. The Alpine MotoSafe is also called 'the universal otoplasty'. MotoSafe consists of two universal hearing protectors equipped with special damping filters against normal wind noise and extra filters for heavier damping. 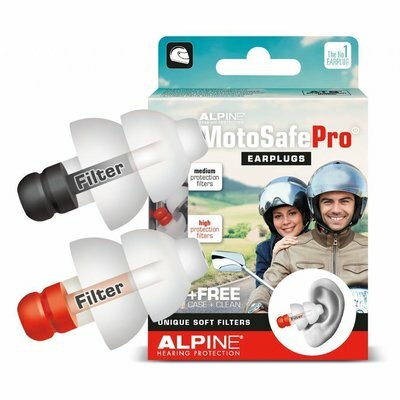 The MotoSafe earplugs are made of a unique, flexible, durable plastic. Due to the warmth of your ear, the caps adjust to the shape of the ear canal within a few minutes. With normal use they will last approx. 2 motor seasons.